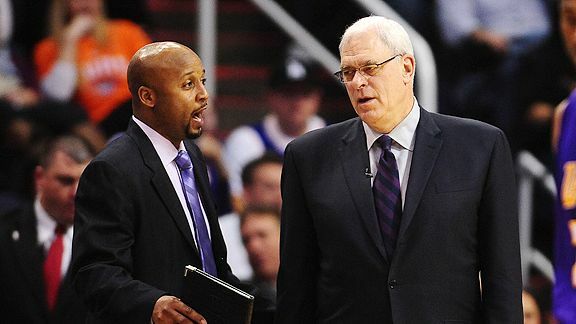 Mark J. Rebilas/US Presswire Is Phil Jackson's right-hand man, Brian Shaw, next in line to the Lakers' throne, or will LA look elsewhere? Slow week in the NBA. Two fewer contract extensions for coaches than last week, to be precise. Things could get a lot slower, too, in coming weeks. Charlotte's Paul Silas, Utah's Tyrone Corbin, Denver's George Karl and Portland's Nate McMillan have all received new deals since mid-February, but the rapidly approaching threat of an extended work stoppage threatens to prompt some teams to proceed more deliberately than usual into the coaching market. The usual rush to get new coaches in place before the draft, with a lockout looming, could easily give way to the leaguewide urge to keep costs down as much as possible. or being dragged into the speculation game unique to the league's coaching carousel. Rivers is one of the NBA's few remaining untouchable coaches, along with San Antonio's Gregg Popovich and the Los Angeles Lakers' Phil Jackson, but countless coaching insiders believe that Rivers will be taking no less than a one-year hiatus at season's end. No matter what happens in the playoffs. So where does Ainge turn if Rivers indeed can't be coaxed back? Celtics assistant coach Lawrence Frank and longtime Ainge teammate Kevin McHale are sure to be linked to the job instantly once it becomes vacant, but more than one veteran Ainge-watcher contacted this week coached me to assume that Ainge has a name or two in mind that no one has even pondered yet, given that (A) he had to be prepared for Rivers' departure after last season and (B) that sort of stealth planning would be classic Ainge. "If anybody in the league has a secret candidate," one coaching source said, "it's Danny." The prevailing sense in Houston is that Adelman, who was lured to the Rockets to coach a presumed title contender fronted by Tracy McGrady and Yao Ming, has little interest in staying there now that it's clear this team is trying to reinvent itself. The Rockets likewise haven't been pushing Adelman to sign one of those extensions so en vogue this month, suggesting that they aren't in a huge rush to stop him from walking. Rockets owner Les Alexander has said repeatedly that he wants to wait until after the season before dealing with Adelman's future, but you can safely assume that Adelman -- despite suggestions that he might be growing weary of the coaching grind at 64 -- is going to get another offer (or three) from a vet-laden team(s) if his four-season run in Houston is indeed over. The suspicion here is that Adelman will be coaching in 2011-12 -- if there is a 2011-12 season -- just not in Clutch City. The dearth of proven coaches on the open market means someone with a résumé like Adelman's, should he leave Houston, would quickly be in demand for other vacancies. As covered in last week's Weekend Dime, ex-Cavs coach Mike Brown (one of those few proven coaches who's unattached) and Dallas Mavericks assistant coach Dwane Casey are the two prime names connected to the Pacers' job, which is widely seen as a lock to open up even if interim coach Vogel can drag Indy into the playoffs despite its recent six-game losing streak. The candidacies of Brown and Casey, though, would appear to depend on Larry Bird staying on as Pacers president. Which is no gimme. The persistent word out of Lakerland is that Phil Jackson, at 65, is serious when he says that this will be his last season coaching Kobe Bryant. Far trickier is figuring out who sits at the front of the line to replace him. Veteran assistant Brian Shaw is the only member of Jackson's staff in the mix, but Shaw, according to one team insider, might have "a better shot than anybody else" purely because of proximity. Rumbles also persist that Lakers alumnus Byron Scott has an out in his contract with Cleveland should the opportunity to come home and coach L.A. arise, but Scott and the Cavs have steadfastly denied it. Portland's McMillan was increasingly mentioned as a top contender to succeed Jackson, which is believed to be one of the factors that prompted the Blazers to press McMillan to sign the two-year extension last week. I heard again this week that the Lakers remain intrigued by the prospect of hiring Jeff Van Gundy -- and you have to presume that the reigning champs are in the select club of teams with the wherewithal to finally lure Van Gundy away from ESPN's courtside announcing table -- but I've had the same question every year when someone says he's a candidate in L.A.: Can Van Gundy really deliver the sort of entertainment that Lakers owner Jerry Buss craves? Kuester has apparently survived the recent shootaround boycott in Philadelphia and should make it to the April 13 season finale -- also in Philly, believe it or not -- barring another unforeseen catastrophe. Yet the lone certainty in Motown, where the Pistons remain in the same murky sale limbo that has gripped them going all the way back to last summer, is that Kuester's career coaching the Pistons has only 14 games to go. Despite the justified heat Detroit's vets got for their unpardonable mutiny, that apparently hasn't stopped some of them from privately referring to their coach as Sean Penn ... as in "Dead Man Walking." But Kuester can't claim to be blameless in the deterioration of the Pistons' culture and has to know that he'll soon be asked to leave, even if no one is quite sure who will be doing the asking. Clarity there can only come when we know who'll be buying the Pistons. Ditto for the discussion about potential Kuester successors as well as Joe Dumars' future, since Dumars' local approval rating has undeniably dipped after the failed hires of Kuester and Michael Curry and the unsuccessful free-agent signings of Ben Gordon and Charlie Villanueva. But Detroit's success for much of the 2000s, Dumars' standing in franchise history as a player and executive and the fact he hasn't had the financial freedom to swing a trade since July 2009 because of the pending sale are all reasons to expect him to be retained by the next regime. The Warriors are within eight games of .500, already have four more wins than last season and have enjoyed a fairly drama-free year by their typically chaotic standards. Not too shabby for a roster still lacking depth, size and proven defenders. None of that, though, might be enough to save Keith Smart. Although Warriors owner Joe Lacob has been largely complimentary of his rookie coach while consistently insisting that Smart will be evaluated on the full 82 games, there are rising doubts about Smart's ability to serve as more than a one-season stopgap after he was promoted by the new ownership group when Don Nelson was ousted mere days before the start of training camp. As with Kuester in Detroit, Smart's contract is only partially guaranteed for next season. Yet the more relevant factor in determining Smart's return or exit -- bigger than recent suggestions of a disconnect between Smart and prized second-year guard Steph Curry -- figures to be the quality of the replacement that the Warriors can land. Lacob has quickly convinced rival teams that he wants to be a splash-maker and has publicly vowed to spend more than loathed predecessor Chris Cohan ever did. Lacob and GM Larry Riley will keep chasing the trade splash that eluded Golden State before the February trade deadline -- which eventually is bound to mean dealing either Curry or Monta Ellis to address some of those other key needs -- but there are generally fewer obstacles when it comes to splashing out for a higher-wattage coach. If the Warriors can find one. The Wolves loudly denounced a recent report from CBSSports.com's respected Ken Berger that Rambis, with two fully guaranteed years left on his contract, is facing immediate danger with Minnesota on a humble 20-62 pace after last season's 15-67 finish. And here's why: Wolves general manager David Kahn, according to sources close to the situation, hired Rambis with the understanding Minnesota would weather struggles last season and this season while waiting for Spanish guard Ricky Rubio to finally hit these shores. Firing Rambis before he gets the chance to coach Rubio -- with the Wolves still stubbornly believing they'll have him next season -- is an audible Kahn doesn't want to call. Could Wolves owner Glen Taylor step in and make a change anyway? Plausible but highly unlikely, sources say, since Rambis hasn't exactly been blessed with a ready-to-contend crew. Taylor, furthermore, isn't about to eat two years of coaching salary and then spend on a replacement at the same time that the Taylor-led NBA Board of Governors is seeking drastic reductions in operating costs in forthcoming labor negotiations. Rambis' early-season clashes with Kevin Love won't soon be forgotten, given Love's popularity and subsequent gaudy production, but don't forget that the Wolves' roster is overflowing with enigmas (Michael Beasley, Darko Milicic and the recently acquired Anthony Randolph) and comparatively devoid of experience. Not the easiest mix to win with. The Kings are on the brink of a new address. And a name change. Can a coaching change be far behind? which would mean a change in the front office, as well, before deciding whether to retain or oust Westphal. The Maloofs, sources say, are fans of former Trail Blazers general manager Kevin Pritchard and increasingly considering him as a potential hire for the looming new era in Orange County as the Anaheim Royals. It remains to be seen if the Maloofs can actually stomach going through with such an aggressive revamp, after working so closely with Geoff Petrie so long, but the Kings have been steadily declining since Petrie's unsuccessful dismantling of their glory-days team from the early 2000s. With the franchise stuck in the league's bottom five for three successive seasons and faced with concerns about how young cornerstones Tyreke Evans and DeMarcus Cousins mesh, there's a rising sense in Sacramento -- in what unavoidably looks like the Kings' final days there -- that the Maloofs' patience has finally run out. Getting a read on the Raptors' future, much like Detroit, will be a lot easier if the Raptors are indeed sold in coming months along with Maple Leaf Sports and Entertainment's other properties. Insiders maintain that current Raptors governor Larry Tanenbaum, should he keep that role after the sale as widely expected in Toronto, badly wants to retain Bryan Colangelo as team president. Colangelo's contract expires June 30, but sources say it's a virtual lock that his long-anticipated contract extension will be pushed through as long as Tanenbaum retains his part-owner status. Only then can you properly assess Triano's status as head coach. The Raptors have a team option on the Canadian-born Triano for next season -- which the Raps are said to be leaning toward exercising despite the team's extremely painful first season after losing Chris Bosh -- but Colangelo is the first domino. The prospect of the Raptors and Toronto Maple Leafs being sold only got serious this month, so it remains to be seen how much is resolved here before the NBA draft on June 23, which falls precisely one week before Colangelo's contract runs out. The standings suggest that the 16-50 Wizards have had another miserable season, which would seemingly endanger both Saunders and team president Ernie Grunfeld. Except that it hasn't been nearly as miserable in the view of first-year Wiz owner Ted Leonsis, even with that hideous road record of 1-30. Leonsis will inevitably remember this as the season that Grunfeld managed to stun the whole league by finding a trade taker for Gilbert Arenas before Christmas, with February acquisition Mike Bibby unexpectedly saving the Wiz even more money by agreeing to forfeit entirely next season's $6.2 million salary for the right to sign with Miami as a free agent. Throw in last season's salary dumps of Caron Butler and Antawn Jamison and the Wiz have saved a ton of money in short order. The onus is now on Grunfeld to make better personnel choices than he did in assembling the previous ill-meshing roster, but the franchise's obvious focus on financial flexibility, stockpiling young assets and playing the kids makes it wholly unfair to judge Saunders -- who was initially hired to take a frustrated older team to the next level -- on wins and losses. with Washington hoping that the cornerstone duo of John Wall and JaVale McGee takes a major step after their unquestioned growing pains in 2010-11. The focus here is fully on Florida, despite the fact (A) GM Otis Smith should really be under far more pressure in Orlando than Stan Van Gundy after making the Gilbert Arenas trade so many of us deemed unnecessary in addition to the Vince Carter-for-Hedo Turkoglu swap and (B) Stan Van Gundy would instantly become one of the hottest commodities on the coaching market even if the Magic can't get out of the first round and Van Gundy is ousted. What we meant to say is that the focus is largely on Miami, where Erik Spoelstra has grown accustomed to near-daily speculation about his job security and where the Heat hold a team option on Spoelstra's contact in 2011-12. Rest assured it's a team option Pat Riley deeply wants to exercise. He's rooting for Spoelstra to succeed for reasons that might be as self-serving and system-validating as they are team-based, but no one disputes Riles' sincerity when he says he does not want to coach this team. Yet he also surely knows that he realistically can't convince Rivers, after everything Doc's been through with the Celtics, to leave Boston to go coach the Celts' heir apparents in the East. Who, then? If it's decided at season's end that Spoelstra will never command the star-filled locker room as much as he needs to, who could the Heat hire to replace him and not only connect more effectively with LeBron James and Dwyane Wade but also coach this team while strictly adhering to the Riley handbook? Mike Fratello's name will always come up because of his years as a Heat broadcaster and the Riley ties that stint forged. But there is no clear-cut fallback option to do it Riley's way. Which helps explain why one coaching source insists Riley is determined to give Spoelstra every opportunity to make this work, believing that his young protégé hasn't been fairly treated by the media but mostly knowing that the roster as currently constructed, with its holes in the frontcourt and at point guard, isn't championship-capable. Even if Riley himself were on the bench. By all accounts we're headed for a lockout that will almost certainly wipe out summer-league play in July and is widely expected, in the best-case scenario, to drag past Oct. 1 and delay the start of the 2011-12 season. So how long will teams that want or need to make coaching changes after the season actually wait to make their hires? Said one NBA coaching source: "This is going to be sort of uncharted territory. Back in 1998, I think we all felt there would eventually be a season. This lockout is going to have more of a doomsday feel, so that could have a bigger effect on how people do things." If history is any guide, there actually will be a few hires announced while the league is shut down. but only one of them did so before the '98 draft. And one team -- you get one guess -- waited until Jan. 14, 1999, to name its new coach, just 27 days before the first game of the lockout-shortened schedule. Q: Are you guys back to where you should be? Back to your best? A: Our mindset is different. We don't really put too much on one game or one streak. I don't know if you guys know that about our team yet. Every game we play, we think it's a game we should win. And that's it. The game we play is the game we want. Q: Let me put it a different way: After the Christmas Day game [losing to Miami], even Kobe said he was concerned. Are you guys no longer concerned? A: I know what Kobe said, but I would play along and say he was just giving you guys something to do. Q: So you don't think he was ever really worried about this team's title chances? A: No. No. I think he was making it interesting for you guys. Q: The Sixth Man Award race looks like it's going to come down to you and Jason Terry. How big a deal would it be to win that award? A: It'd be great. It'd be awesome. But I'm just trying to play well. Q: Wouldn't it kind of validate the way you've accepted and adapted to coming off the bench? A: It'd be a great accomplishment. Sometimes it's tough, especially the way I had it going early in the year. Sometimes it's tough, but I'm just trying to make shots, stay focused and do what the team needs me to do so we can win our third championship in a row. we are asking all player agents to discuss with each of their clients on an individual basis: (i) the player's negotiated deal and financial status; (ii) how the player can expect that his deal and status might change under a more restrictive system; and (iii) steps the player can take to withstand what is likely to be a months-long lockout." Passage from a letter earlier this month that was dispatched by the NBA Players Association to all certified agents and obtained by ESPN.com. The threat of an extended work stoppage has hung over this league for months. It should surprise no one when the NBA shuts down July 1, especially when you see the daily dispatches on every ESPN platform about the NFL's lockout in a league in which the owners and players are said to be much closer to finding a common labor ground than their hoops counterparts. It unsettles you, even when you know it's coming, to see lockout talk in writing on union letterhead in such absolute terms. Nothing in the above passage is binding. Just as the union dismisses NBA commissioner David Stern's claims that the league will lose some $350 million this season or the fact owners want to eliminate at least $750 million in player salaries as mere negotiating rhetoric, we'll have to see long-term resolve and unity from the players before we believe that they're willing to miss several paychecks to fight for more favorable terms in the next labor deal. The mindset of union leaders, however, is clear. They know how badly NBA owners want that "more restrictive system" featuring a hard salary cap and shorter guaranteed contracts. In a 56-page handbook players have received this season to help them prepare for a lockout -- which was reviewed at length last week by Bloomberg News -- NBPA executive director Billy Hunter acknowledges the union will have to be willing to "fight for a deal" to limit the severity of the cuts. Willing for "months," according to that letter. The NBA obviously doesn't stop for the NCAA tournament. It's the opposite, actually. Brackets dominate discussion in every locker room on the Association map. That's true even in Memphis, where the Grizzlies banned card-playing on team flights in January after the Tony Allen-O.J. Mayo fight but do, I'm told, have the usual team-wide NCAA pool going. There's no shortage of rooting interests beyond mere brackets, too. The ever-trusty Pete Newmann from ESPN Stats & Info has compiled a lengthy list of notable NBA folks with sons/brothers/relatives in the tourney, which TNT's David Aldridge likewise addressed in this column earlier in the week. Randy Ayers (Hornets) Cameron Ayers (Bucknell) Fr. Tony DiLeo (76ers) T.J. DiLeo (Temple) So. Joe Dumars (Pistons) Jordan Dumars (Michigan) So. Trevor Booker (Wizards) Devin Booker (Clemson) So. Stephen Curry (Warriors) Seth Curry (Duke) So. Tyler Hansbrough (Pacers) Ben Hansbrough (Notre Dame) Sr.
Jrue Holiday (76ers) Justin Holiday (Washington) Sr.
Al Horford (Hawks) Jon Horford (Michigan) Fr. J.R. Smith (Nuggets) Chris Smith (Louisville) Jr.
Dell Curry Seth Curry (Duke) So. Ledell Eackles Ledrick Eackles (Oakland) So. Harvey/Horace Grant Jerai Grant* (Clemson) Sr.
Harvey/Horace Grant Jerain Grant* (Notre Dame) Fr. 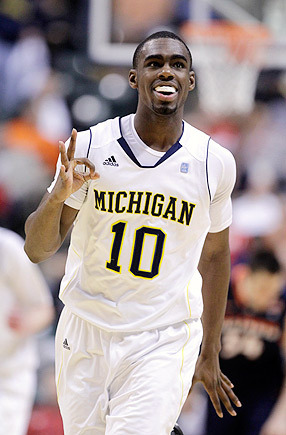 Tim Hardaway Tim Hardaway Jr. (Michigan) Fr. Tito Horford Jon Horford (Michigan) Fr. John Hummer Ian Hummer* (Princeton) So. Christian Laettner Mike Broghammer* (Notre Dame) So. John Lucas Jai Lucas (Texas) Sr.
Gary/Bill Melchionni Dean Melchionni** (Texas) So. Jay Murphy Erik Murphy (Florida) So. Paul Pressey Matt Pressey (Missouri) Jr.
Paul Pressey Phil Pressey (Missouri) Fr. Derek Smith Nolan Smith (Duke) Sr.
John Stockton David Stockton (Gonzaga) Fr. Jeff Taylor Jeffrey Taylor (Vanderbilt) Jr.
Jerry West Jonnie West (West Virginia) Sr.
Orlando Woolridge Renaldo Woolridge (Tennessee) Jr.
• Spurs president of basketball operations R.C. Buford is the legal guardian of Texas forward Alexis Wangmene. 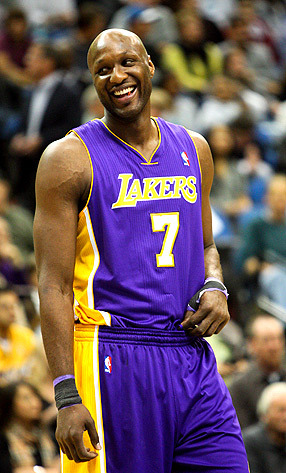 The Bufords met Wangmene in the Basketball Without Borders program in 2004. • Josh Bartelstein (Michigan) is the son of veteran NBA player agent Mark Bartelstein. • Noah Dahlman (Wofford) is the grandson of former NBA coach John Kundla. If L.A. takes the championship in what Phil Jackson swears will be his farewell season in Lakerland, he'll become the first coach in NBA history to win it all at age 65. He'd also become just the sixth coach or manager to lead a team to a championship at age 65 or older in the four major North American team sports. ESPN analyst Tim Legler and host Jonathan Coachman check in from the "NBA Tonight" desk to weigh in on the latest edition of Marc Stein's weekly NBA Power Rankings on ESPN.com.